We’re going to stretch the definition of “food” a little bit here today to bring you some fun stuff that’s cool and refreshing and doesn’t involve any ovens or grills. We’re talking about ice – and not just the clear stuff that comes in boring old cubes. 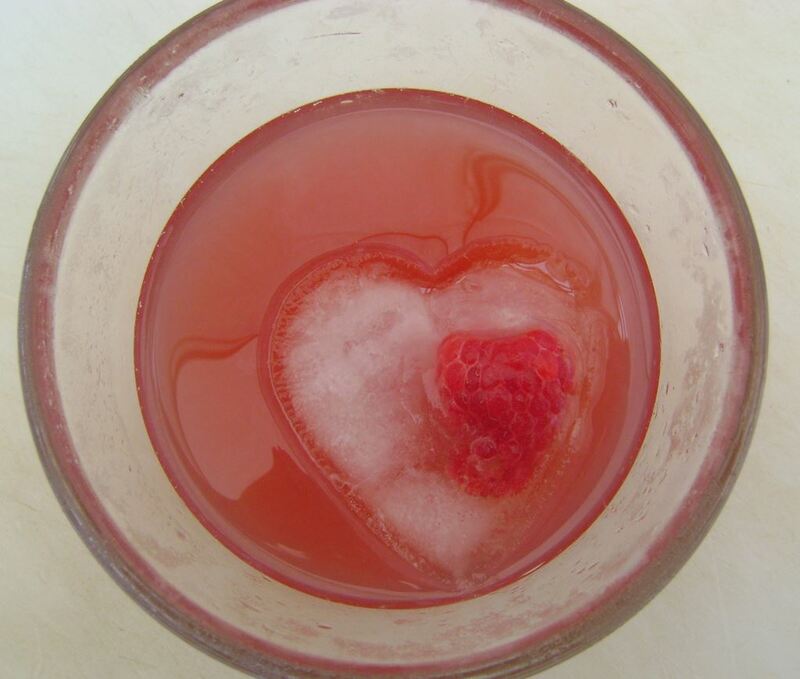 This time we’re looking at ice that makes happy, floating art in your drinks. The great thing about ice is that it can be in just about any shape, and it doesn’t have to be water. 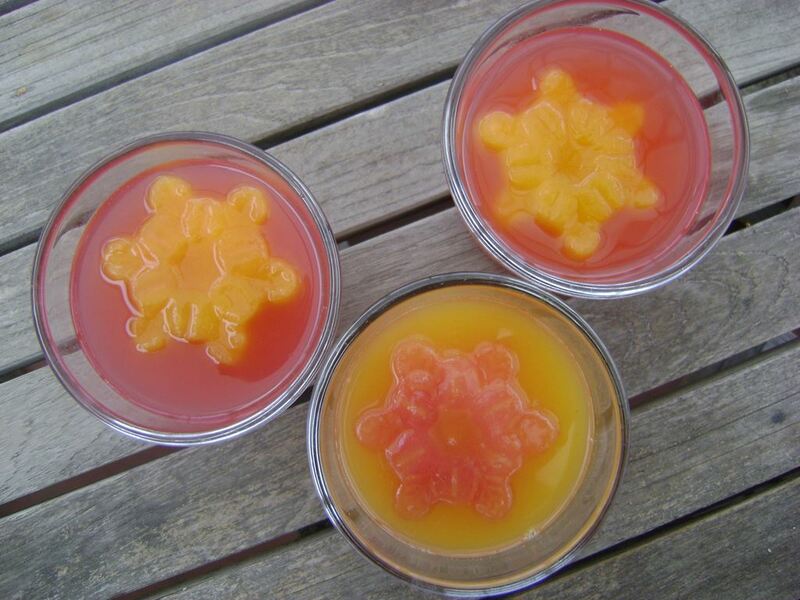 With this in mind, we started experimenting a little bit with various juices and shapes. We didn’t quite get organized in time to buy those fancy ice cube trays, so we just tried to improvise with what we had on hand. In the kitchen we found a silicone baking pan with little compartments in the shape of snowflakes. Perfect. We had some peach nectar on hand, as well as some cranberry-pomegranate limeade, so we decided to make these Sunshine Snow Flurries. Kitchen note: Make sure the juice (and the cups or glasses, if possible) are chilled beforehand because any kind of ice with fine details melts quickly. Next we tried using small cookie cutters to make ice shapes. We filled a small, flat Tupperware container with water and set our smallest cookie cutters in the water, added some fruit inside each cookie cutter, and then stuck the whole thing in the freezer. When it was finally frozen, we chipped off the ice around the cookie cutters, and then gently popped out each ice mold. And thus Icy Raspberry Heart Punch was born. If you’re going to use cookie cutters, use the smallest ones you can find that will fit within the mouth of the glass. And try to avoid using shapes with lots of tiny details – especially parts that stick out. We made a super-cute blueberry fish but the tail bit the dust as soon as it hit the juice. Hey – we should have taken a picture – we could have posted it on Food Flop Friday. Oh, well. There will be more opportunities – of that we’re sure. HI! everyone having a great summer? I’ve been down at 14th freezing at Beach camp… come down and freeze with me! Love the colors of your site…. ok if i add your site to my web page for SBAS? lots of great ideas… good sites to check out…. bye from teacher lynn and wrio and scout!